Traditionally, when a couple gets married, they merge their money along with their lives. For example, that may mean taking shared responsibility for paying bills or developing joint savings goals. It can also mean combining their paychecks or other recurring income, such as tax refunds and cash gifts from the wedding, into a single bank account. For many couples, a joint bank account is the ultimate symbolic gesture of their financial union. But that doesn't mean it's a system that works for all couples. In a 2016 TD Bank Survey, 76 percent of couples said they shared at least one bank account. That means roughly a quarter of couples keep their finances separate. Surprisingly, millennials were the least likely to be in favor of sharing bank accounts, compared to older generations. Whether you’re a newlywed or in a long-term relationship, deciding how to manage your bank accounts should be a top priority. Weighing the pros and cons of all options can help in making a decision. Having one bank account offers a number of benefits. For example, sharing an account allows each spouse access to money when they need it. 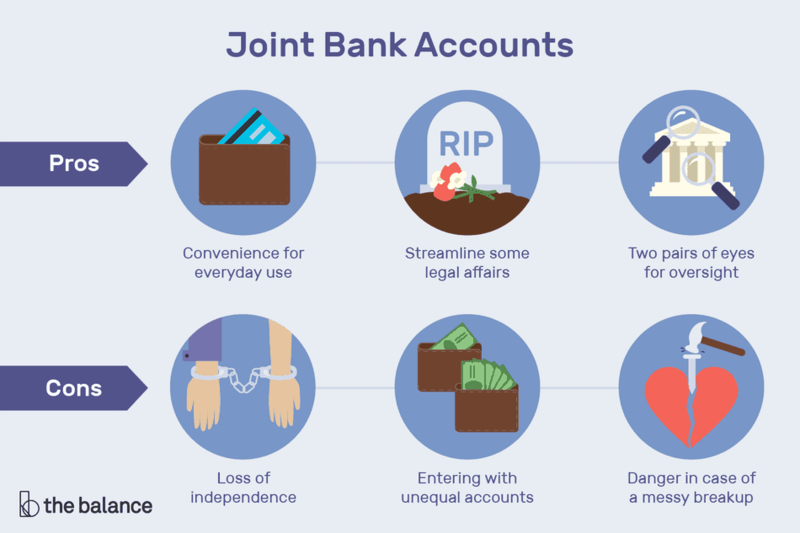 Joint bank accounts usually provide each account holder with a debit card, a checkbook and the ability to make deposits and withdraw funds. If your bank provides it, each of you would also have online access to account information and tools, which can simplify paying bills and other shared financial tasks. Some legal affairs are also streamlined with joint bank accounts. In the event that one spouse passes away, the other spouse will retain access to the funds in a joint account without having to refer to a will or go through the legal system to claim the money. Depending on the state and local laws, the surviving spouse may have to go through a lengthy legal process to claim money in a separate account. Finally, one of the main advantages of a joint bank account is that there's a smaller chance of encountering financial “surprises” when all money goes into and comes out of one account that both of you can see. Married couples with joint accounts may find it easier to keep track of their finances because all expenses come out of one account. This makes it harder to miss account activity, such as withdrawals and payments, and easier to balance the checkbook at the end of the month. While sharing a bank account can simplify your money management system, some couples may feel a loss of financial independence with a joint bank account, especially early in the marriage. With separate accounts, each spouse maintains an individual degree of freedom over their finances. One major drawback to sharing a joint bank account is that it can cause issues in a marriage when spouses aren't communicating about their account activity. Problems may also arise when one spouse enters the marriage with student loans, credit cards, alimony, child support or other debt that must now be paid with joint funds. This situation can often cause resentment in the other spouse, who may become responsible for paying the debt as well. To avoid money arguments, couples should discuss their separate debts in detail before deciding on which kind of banking works best for them. A joint account can also be problematic if the relationship ends. If the couple decides to part ways, the funds in a joint account can be messy to separate. Each spouse has every right to withdraw money and close the account without the consent of the other, and one party can easily leave the other penniless. Separate bank accounts prevent that scenario and can allow for an easier break that often doesn’t involve a long fight to fully separate the finances. Examining the benefits and drawbacks of all the options will help lay a strong financial foundation and ensure that each spouse is on the same page. Couples who revisit their decision every so often may also find success by making sure their strategy still works for them. If you and your spouse prefer to keep separate bank accounts, you should have a discussion about it as early in the marriage as possible to establish a financial plan for the future. Married couples can choose to maintain separate accounts and also open a joint account in which they deposit a portion of their income that they both agree on. This way, you both enjoy the benefits of a joint account while still maintaining the independence of divided finances. Couples can also choose to keep separate checking accounts and start a joint saving account for vacations, down payment for a home, kids’ college tuition, or retirement. How will regular household expenses, such as the mortgage or utility bills be divided? Have detailed financial discussions with your spouse frequently to determine what makes sense. As one financial expert has stated, come up with a financial blueprint on an annual basis so that you can think about how you are spending and budgeting your money as a couple so that you can enjoy it in the long run.